The sternocleidomastoid muscle, or SCM is to me, one of the most fascinating muscles in the body. Most people are totally unaware of its existence, as it sits innocently in the front of the neck. The reason for the lack of awareness is because it rarely hurts: I have only had two patients who actually felt pain over the muscle, and this was from fairly severe car accidents. The sternocleidomastoid muscle, however, creates a tremendous amount of trouble for people in the form of headaches, facial pain, jaw pain and tension, and even stranger symptoms, like dizziness, brain fog, blurry vision, and even hearing loss! This two parted muscle begins at the skull behind the ear. From there, the sternal division (pictured at the right) attaches to the sternum or breast bone, and the clavicular division attaches to the clavicle or collar bone. It is named for these three attachments. Since it is just under the skin, you can see it pop out when you turn your head all the way to the opposite side: So turn your head all the way to the right and put your hand on the front of your neck... you will feel the SCM pop out like a rod under your hand. What symptoms does the Sternocleidomastoid Muscle cause? The SCM can cause a variety of symptoms including head and face pain, balance problems, visual disturbances, ear and sinus symptoms, and more body wide symptoms. It is the only muscle that creates such wide spread problems. Each will be explored below. The sternal division (pictured above) can send pain to the cheek, which can imitate trigeminal neuralgia which is an irritation of the nerve to the face. Occasionally, it can create pain in the top of the breast bone. It can create pain deep in the eye, and above and below the eye, often feeling like sinusitis. It can create a sore throat and pain at the back of the tongue, particularly with swallowing. It can also send pain to the chin. Trigger points near the upper end send pain to the back of the head along the occiput and to the top of the head like a skull cap, that can also be tender to the touch. The clavicular division (pictured below) sends pain to the forehead... when it is severe, it can spread to the other side as well, which is quite unusual for a trigger point to refer to the opposite side of the body. the upper part of the muscle can create pain deep in the ear and behind the ear. It can also create an ache in the cheek and molars on the same side of the face. These problems are associated with the clavicular or deep division of the SCM. Usually, patients perceive this as a disagreeable sensation in the head with movement or an unsteadiness, and less often as a spinning sensation. They can also feel unsteady on their feet and veer unintentionally to one side when walking. It can cause falls when bending or stooping, or feeling like they are pitching over backward when looking up. In very severe cases, sudden stretching of this muscle can actually cause fainting. 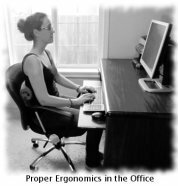 The dizziness can last from seconds to hours following stretching or using the SCM. 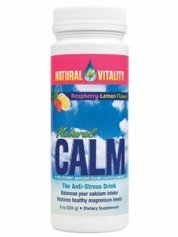 This can also create nausea, but not vomiting. The SCM signals the brain about the orientation of the head in relation to the body, so when there are trigger points in this branch of the SCM, the brain gets faulty information, creating the dizziness. The sternal division can create tearing and reddening (blood shot) in the same side eye. It can also create a "drooping" of the eyelid caused by a spasm of the muscle around the eye (the obicularis oculi muscle). This muscle can also create twitching of the eye or eyelid. There can also be blurring of vision, dimming of perceived light intensity, and double vision. The print may even seem to "jump around" when a patient tries to read. These symptoms seem to be due to the referred effect on the eye muscles. The sternal division can actually create deafness, or decreased ability to hear in the ear on the same side. It can also create a crackling sound, though not usually tinnitus. This is usually associated with the deep division of the masseter muscle(Click here for a picture). The pain that can imitate an ear ache is from the clavicular division. It can also occasional create an "itch" deep in the external ear canal. In addition to the referred pain detailed above which can imitate sinus pain patterns, trigger points in the sternal division can actually create sinus congestion, runny nose, and tearing on the same side as the trigger points. I had a patient that had been having "sinus headaches" for 10 years. He had been through MRI scans, CT scans, and even had exploratory surgery done to his sinuses to find the cause of headaches. It turns out it was just SCM trigger points, giving him a constant headache. The SCM can create other systemic symptoms that can be very hard to trace back to this muscle. These include tooth ache, nausea, a dry cough, hoarseness of the voice, or a cold sweat on the forehead. The sensitive trigger points can be mistaken for "swollen glands" or lymph nodes. Severe trigger points in infants and young children may be diagnosed as muscular torticollis, but can be treated as you would treat any trigger point. 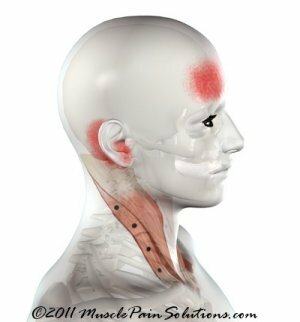 What Causes Trigger Points in the Sternocleidomastoid Muscle? 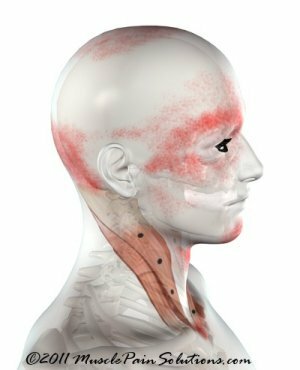 How do you treat Sternocleidomastoid trigger points? Fortunately, treating them is not that difficult. Turn your head slightly away from the side you are working on to make the muscle pop out. Then grab as much of the muscle as you can and knead firmly. Try to feel the two divisions: they lie on top of one another. If you grab as much soft tissue as you can, you should be pinching the clavicular division, which is the deeper of the two. Then roll off of it, and you will be pinching the sternal division. Start near the collar bone and work up toward the skull behind your ear. If they hurt when you squeeze them, they are probably creating problems for you. If the trigger points are bad enough, they may even reproduce the symptoms you have been experiencing. The way I treat them is to squeeze hard enough to feel some symptoms, but not so hard that I tense up. Then I wait for the symptoms to subside, and then squeeze harder. If you do this 3-6 times per day, you should make a significant change in your symptoms in about 2 weeks. It should be harder to find the trigger points, and the symptoms should be decreasing in frequency and intensity. If they are not, try to analyze what you are doing during the day, particularly with work and sleep and see if you are doing something that continues to re-aggravate them. Also, check out the other pages about trigger points to see if there is anything else you can do to help. Return to What causes headaches for other pointers on treatment. Return from Sternocleidomastoid muscle to Home.